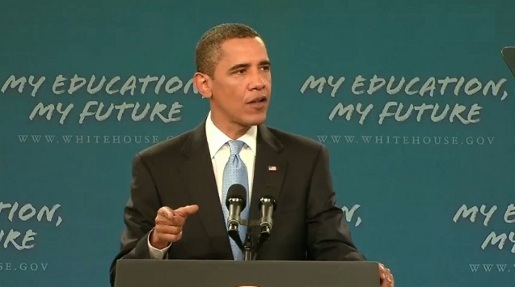 Barack Obama’s speech to returning students has been aired live in schools throughout the United States, challenging them to take responsibility for their education, set goals and do everything they can do to succeed. The speech, broadcast live from Wakefield High School in Arlington, Virginia, is now available on YouTube and Facebook and iTunes, available to download as a 320 mb mp4 video, and is embedded on blogs and news sites. The speech has been supported with the distribution of badges linking to the live broadcast at www.whitehouse.gov/mediaresources, and a NASCAR-related promotional PSA video. Obama’s speech was delivered at 12 noon on Tuesday September 8, the first day of school for many students. Wakefield School student Tim Spicer introduced the President while outside on the streets a handful of parents staged a protest against what they perceived to be a political interference in education. Jeff Gordon, Dale Earnhardt Jr., Carl Edwards, Tony Stewart and Juan Pablo Montoya share a motivational message for America’s students. Student Reporter Damon Weaver was invited to come to the White House to talk about education with President Obama, breaking the news about the national speech to students. The transcript was made available beforehand to allay fears from parents and educationalists that Obama would use the speech for party political purposes. Now I’ve given a lot of speeches about education. And I’ve talked a lot about responsibility. I’ve talked about your teachers’ responsibility for inspiring you, and pushing you to learn. I’ve talked about your parents’ responsibility for making sure you stay on track, and get your homework done, and don’t spend every waking hour in front of the TV or with that Xbox. I’ve talked a lot about your government’s responsibility for setting high standards, supporting teachers and principals, and turning around schools that aren’t working where students aren’t getting the opportunities they deserve. And that’s what I want to focus on today: the responsibility each of you has for your education. I want to start with the responsibility you have to yourself. Every single one of you has something you’re good at. Every single one of you has something to offer. And you have a responsibility to yourself to discover what that is. That’s the opportunity an education can provide. Where you are right now doesn’t have to determine where you’ll end up. No one’s written your destiny for you. Here in America, you write your own destiny. You make your own future. That’s what young people like you are doing every day, all across America.